ATOM NETBOOK COMPUTER GIVEAWAY EVENT Linda's Angels has joined up with some AMAZING bloggers to bring you this spectacular giveaway! 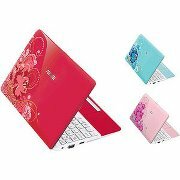 The winner will receive the following: (1) 10.1″ 1015PX ATOM Netbook Computer – PC with Intel Atom N570 Mobile Processor, includes Case, and Mouse Bundle. COLOR BLUE The Specs are: Intel Atom N570 mobile processor 1.66GHz, 1MB L2 Cache 1GB DDR3 DRAM system memory Expandable to 2GB Allows you to do the computer basics of web surfing, emails and documents 250GB hard drive Store 166,000 photos, 71,000 songs or 131 hours of HD video and more 10/100Mbps Ethernet, 802.11b/g/n Wireless LAN Connect to a broadband modem with wired Ethernet or wirelessly connect to a Wi-Fi signal or hotspot with the 802.11b/g/n connection built into your PC 10.1″ no-glare display Intel UMA Graphics with up to 256MB total graphics memory Webcam with built-in microphone 3-in-1 memory card reader 3x USB 2.0 ports, 1x headphone jack, 1x microphone jack, 1x RJ-45 Ethernet port, 1x VGA port 3-cell lithium-ion battery, up to 3 h 39 min battery life Software: Genuine Microsoft Windows 7 Starter Edition Microsoft Office Starter 2010: Includes reduced functionality versions of Microsoft Word and Excel, with advertising. PowerPoint and Outlook are NOT included. TMS security software (30-day trial) Backup and Restore options built into Windows allows you to create safety copies of your most important personal files, so you’re always prepared for the worst Enter using the Rafflecopter form below. Best of luck!